No one expects to read Pulitzer Prize-winning literature on the solar-powered traffic signs near construction zones, but still, the picture on the left makes an argument for writing clearly and efficiently. 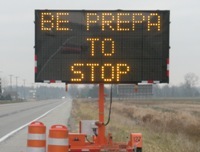 Why would the sign guy invent an abbreviation for the word "prepared" when the phrase "Prepare to stop" is easier to understand at a glance? Is your marketing copy as direct as it could be, or are you taking readers on a longer, more challenging route to your point? Whether driving by your billboard at 55 miles per hour or scanning your website, your audience often needs to see your information quickly. Make sure your content is efficient and easy to understand, or be "prepa" to lose their attention.